Blackjack strategy games terms, part 3, completes blackjack gamerisms. This section includes blackjack terms that are unique to this casino game: Natural, Perfect Pairs, Plug, Rainbow Bet and Spanish 21. The glossary concludes with Blackjack Tips: Errors & Corrections. Hand: a round of play. Also cards held by the player and/or dealer. Hard Hand: those hands that do not contain an ace or a hand where the ace is valued at 1 are hard hands as there is only one value. Opposite of soft hands. Hard Total: blackjack lingo for count of those hands that do not contain an ace or a hand where the ace is valued at only 1. Heads Up: blackjack jargon for player against the dealer with no other participants. Hit: dealt additional card(s) to the 2 cards dealt originally. Also known as draw, draw card or hit card. The decision to hit is indicated by a sweeping motion on the felt by the player or tapping the felt in a face up game. Hole Card: dealer’s card dealt face down. House Advantage/House Edge: refers to the casino % advantage vs. the player. Insurance: when dealer’s up card is an ace, there will be a call for insurance. If you make an insurance bet that the dealer has blackjack, this wager is placed on the insurance line displayed on the felt. If the dealer has blackjack, you win the insurance bet; however, your original bet is lost. If there is no blackjack, you lose the insurance bet. The insurance bet is not recommended. Late Surrender: player loses 50% of bet if he/she decides to surrender after seeing the dealer’s up card. Multiple Decks: more than one deck is in play here. a value of 10 for 21. Pays 3 to 2. Nickel: blackjack lingo for $5 chip. 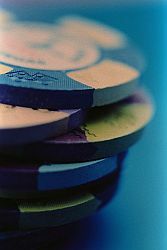 No Hole Card: blackjack version where the dealer does not receive a second card until all the players have completed their hands. Paint: blackjack lingo for face cards—Jack, Queen and King. Pair: two cards of the same value, example=pair of tens. Pat Hand: blackjack hand that has a value of hard 17 or better and does not require a hit. Penetration: cards played into the shoe before shuffling occurs. This is a factor to consider for card counters. Perfect Pairs: blackjack jargon for side bet that pays for mixed pair, colored pair, and perfect pair after the initial deal. Pip: card spots indicating the value of the card. Pitch Game: term for tossing or pitching cards to players by the dealer. This occurs with single or double deck games dealt face down. Play All: blackjack players who stay to play during the ups and downs of the game. Also refers to multiple deck games. Playing Conditions: casino options offered to players. The many options including double down rules, early/late surrender and splitting can vary widely between land-based casino and online games worldwide. Plug: blackjack strategy games term for shuffling of multi-deck games. Occurs with the insertion of a cut card marking the place that all decks will be re-shuffled. The group of cards behind the cut card are not used to play, but rather placed in the discard tray along with other discards when the cut-card is reached. This group of unplayed cards are named a plug or otherwise plugging the deck. Point Count: blackjack jargon for the net value of the card count after a hand is completed. Preferential Shuffling: term for player advantage when remaining cards are shuffled. Press: increase betting, usually by at least 50% after a winning hand. Progression Betting: blackjack strategy for betting based on previous hand(s). Positive progression is raising or pressing the bet after a win while negative progression is raising the bet after a loss. Push or Tie: occurs when both dealer and player have the same count neither of which is 21. The player’s bet is returned. Rainbow Bet: wagering with several colors/denomination of playing chips. Red Chip: blackjack lingo for $5 chip. Resplit: splitting pairs yet again. A dream hand if Aces show up. RSA: short form for resplit aces with no limit. Some casinos have rules for RSA. Round: occurs when all players have completed their blackjack hands. Running Count: total points from card-counting method beginning with first hand dealt after new shuffle and updated after each hand. S17: short form for dealer stands on all 17’s. Shoe: design of holder, either wood or heavy plastic, of up to 8 decks in play. Shuffle: blending the cards before dealing to players. Side Bet: additional bet along with the primary bet. Soft Hand: also known as soft hand or soft total that holds an ace counted as 11. Example: ace-7 equals a soft 18. However, if the value of the ace is changed to 1, it is consider a hard hand. Soft Double: doubling down when one card is an ace. Spanish 21: blackjack version where the 4-ten cards are removed. Split/Splitting Pairs: splitting a matched pair to play separately. The extra bet is placed on one of the split cards. If a third like card is dealt=JJJ, then that too can be split based on casino rules. Splitting Aces: when you split aces, you receive only 1 additional card for each hand. However, based on casino rules you may split a third ace if dealt. Spooking: blackjack strategy games term for passing info to a playing partner after eyeing the dealer’s hole card. An illegal form of cheating. Stand and Stay: player decision not to draw additional cards/hits. Standoff, Tie or Push: occurs when both dealer and player have the same count neither of which is 21. The player’s bet is returned. Steam: term for a player who increases his/her bets to recoup losses. Stiff/Stiff Hand: card count of 12, 13, 14, 15, or 16 that will bust or go over 21 with one card. Also breaking hand. Streak: string of wins or losses. Surrender: choose surrender after receiving first two cards and you lose only 50% of the bet. Team Play: several players who utilize one bankroll and are skillful blackjack players. Tells: blackjack lingo for signals in the form of gestures or attitude expressed by the dealer that may provide useful strategies as to the value of their hole card. Third Base/Third Baseman: blackjack jargon for player to the right of the dealer receiving the last card. Also, see anchor. Twenty-One or 21: term for the game of blackjack. Up Card: dealt face up, this is the dealer’s first card. 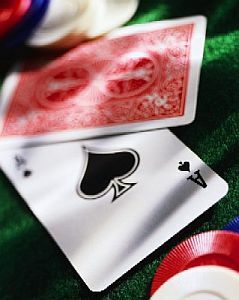 Blackjack Errors has kept most players from enjoying the low edges against them or gaining the edge against the house. These errors that occur during the decisions for hitting, standing, doubling down, and splitting pairs can be corrected and rewarded with smaller house advantages for both multiple-deck games and single-deck games, thereby trimmed to as little as 0.14 percent. Over time, how much a player wins or loses comes down to the player. Below find a list of 6 of the most common blackjack errors, the correct action and the reason to make the smart choice resulting in increased profits. These corrections are based on computer play of every player hand versus every dealer upcard. In other words, pay attention to the math! If you have a hand of 12, about two-thirds of the cards that can come out are not going to bust you. The 16 is a losing hand no matter what you do but on two cards, you will lose slightly less if you hit than if you stand. A hand of 18 is a losing hand in the long run. With the dealer in a weak position, you want to get more money on the table and take advantage of it. Another loser 18, however since you cannot bust, you have a shot of improving your hand. It’s a given that you never split fives with a 10 in your hand. Go for the double because you have a very good chance of winning twice your bet. Don’t give the casino an advantage when you opt for insurance. Consider that when you have 2 ten-valued cards, the dealer is less likely to have blackjack. The house edge on insurance is at least 5%, so back away from this bet. Make those smart choices and Play On!